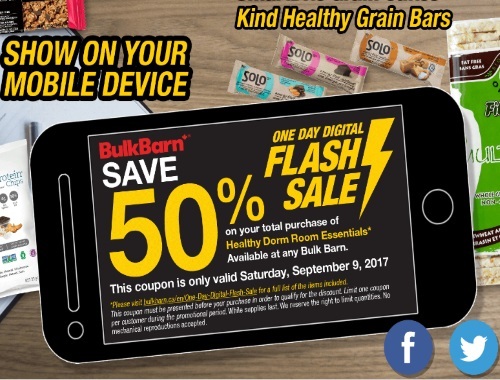 Bulk Barn has another digital one-day Flash Sale! Save 50% off healthy dorm room essentials! This offer includs Simply Protein Chips, SoLo Gi Energy bars, SmartBite Grain Cakes, Kind Healthy Grain Bars. Show the coupon on your mobile device. Offer is valid Saturday, September 9, 2017 only.